May and I have been taking courses in natural horsemanship - known as ethologie in french and sometimes as "horse whispering" in english. But the idea is basically to communicate with your horse in a mutually comprehensible language without the use of force or fear and to build partnership, trust and "lightness". This idea of lightness is aimed at being able to use the lightest touch and command/request and get an instant response, thus avoiding the use of harsh tones of voice, kicking when riding, tugging on a bit in a horses's mouth etc. May, as you all know, is a pure-bred fjord pony. Fjords have a reputation for being a bit strong-willed and stubborn, although also great all-rounders. 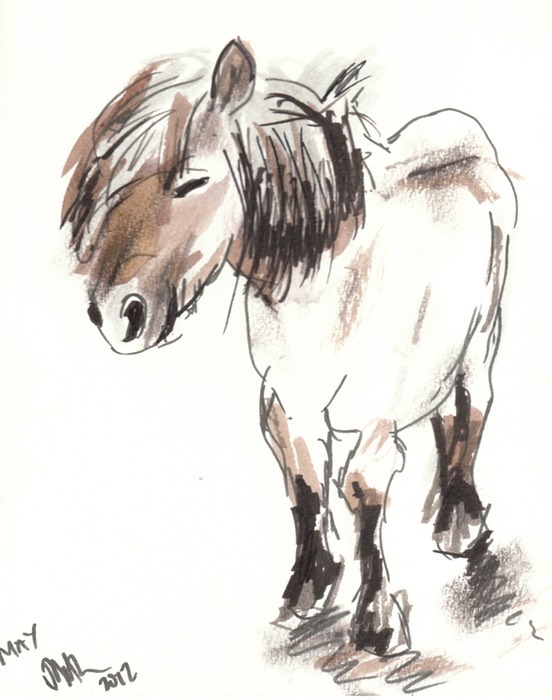 But they are draught horses, albeit small ones, the kind of horse one would not associate with being sensitive, unlike flighty thoroughbreds for example. 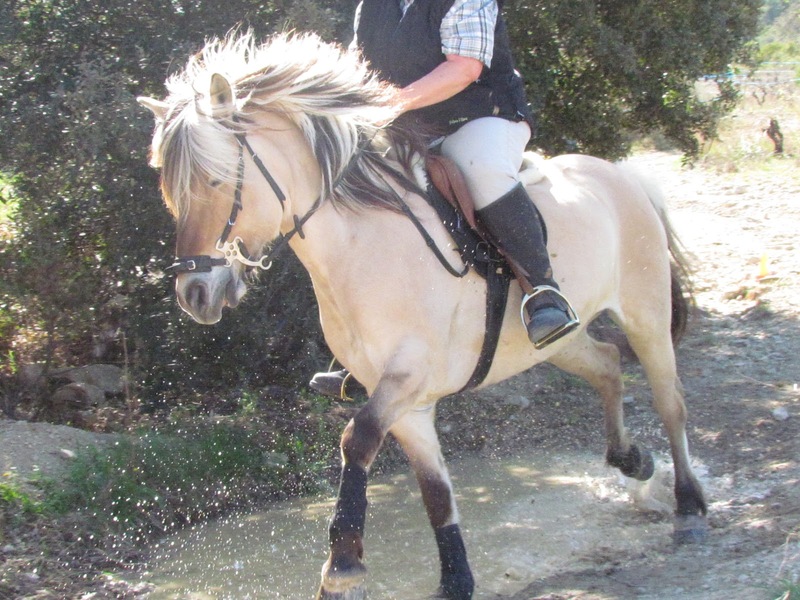 But it turns out that May is in face very sensitive, and I am also delighted that this hasn't been dulled by her years in a riding school (a credit to our club, where the horses really are treated well and good standards of horsemanship are insisted upon). After our first go at ethology May was reversing away from me (respecting my space) at the lightest touch on her nose. I was very surprised, and we have quickly advanced to working on a long line with a carrot stick as an extension of my arm, so that she can complete tasks without being touched. I decided to use our new techniques to work on our differences about puddles. We like doing trec competitions but May does not like water (the photo below shows her making sure she kept her feet dry in a competition last year) and there are usually water obstacles involved. If she sees a puddle on our routes, she makes sure she avoids them, however hard I try to push her in a straight line through them. Of course from a horse's point of view, a puddle could be 20 feet deep, they can't tell it is safe to go through so it is a matter of trusting the rider. After the last heavy rain there was an enormous (at least ten feet long and four across) puddle across one side of the round pen at the club, so May and I worked on small circles on the parelli long line, then larger circles incorporating the edges of the puddle and working larger and larger until she was walking happily through the puddle parallel to me as well as in circles. The principle of the work on a rope at distance, and her respect of my space meant that she was obliged to put her trust in me and try the puddle. Once she realised she was not going to drown, a big step, she got quite excited about the whole thing and considered having a roll but thought better of it in the end. I was really proud of us both, that I had merited her trust and that I was able to ask her to hear me at the end of long rope. The next day we repeated the exercise, firstly in just the ethological rope headcollar and then saddled and bridled but still with the headcollar. Then I tried it mounted, and after a small hesitation May went straight through, both ways. I was so proud. This isn't the same as being out on the trail though, but it rained again last week and we went out for a little ride, and although May avoided the first puddle, after that she went straight through them all. I am so happy. We have a competition again in March so we will see how she goes. But it was great to prove to us both that the natural approach is effective, so often you see people whipping their horses through water obstacles, it is really ugly. More often than not the horse eventually gives in, showing us their huge generosity of heart, but how much nicer to work with your horse so that they are happy to go through the water with you, instead of because they are too scared of pain not to?